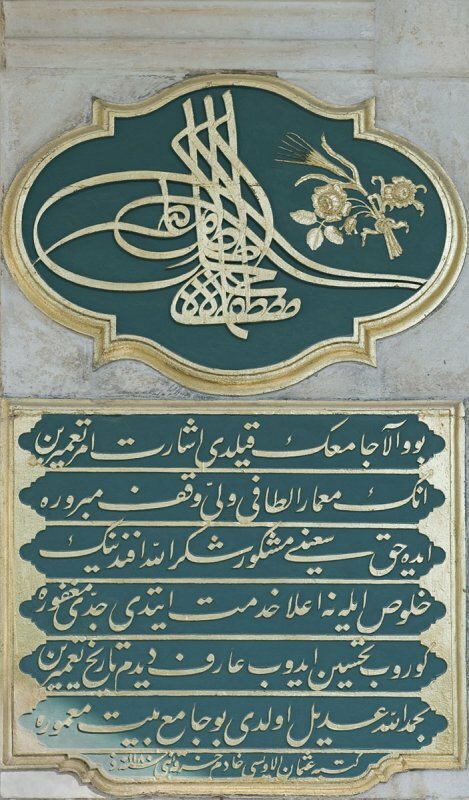 On the picture: A calligraphic inscription in the porch on the north side of the Nişancı Mehmet Paşa mosque (next to the entrance). This building inscription dates from the restoration of the mosque in 1766. Above it: the ‘tuğra’ of Mustafa III, who was the sultan at the time. A ‘tuğra’: a calligraphic monogram, seal or signature of an Ottoman sultan, that was affixed to all official documents and correspondence. It was also carved on his seal and stamped on the coins minted during his reign. Each sultan generally chose the precise form of his ‘tuğra’ on the day of his accession from specimens prepared for him in advance by the court calligrapher. The first ‘tuğra’ belonged to Orhan I (1284–1359), the second ruler of the Ottoman Empire and it evolved until it reached the classical form in the ‘tuğra’ of Sultan Suleiman the Magnificent (1494–1566). Sources: ‘Türkiye Tarihi Yerler Kılavuzu’ – M.Orhan Bayrak, Inkılâp Kitabevi, Istanbul, 1994 & Wikipedia.